For the second year in a row, Hymer has won internationally recognised Red Dot Design Awards for outstanding design from the Design Zentrum Nordrhein-Westfalen. The Hymermobil B-Class Modern- Comfort l 580 and the ERIBA Touring 820 caravan were honoured for their high quality designs with the Red Dot Award in the Motorhome and Caravan product categories respectively. The Hymermobil B-Class ModernComfort I 580, features a completely redesigned interior concept as well as particularly light yet sturdy bodywork. The ERIBA Touring 820 is a new flagship caravan from Hymer’s popular Touring model range, which was also honoured with a Red Dot Award in the Product Design category. The award ceremony will take place on 8 July 2019 in Essen, Germany. A specialist jury of around 40 international designers and experts assesses the submissions and presents awards for the best designs. Criteria such as innovation, functionality and the quality of the submitted products play an important role in their decision. The Hymermobil B-Class ModernComfort l 580 particularly wowed the jury with its dynamic looks. The motorhome’s exterior is based on the lines of the new Mercedes-Benz Sprinter. The combination of the new Sprinter chassis cowl from Mercedes-Benz Vans and the award-winning HYMER SLC chassis gives the motorhome especially light bodywork and a spacious double floor. This not only ensures a level upper floor throughout the vehicle, but also provides enough space to house all the technical components. Inside the vehicle, Hymer has come up with a modern and completely redesigned interior concept. The central design element here is the strict line management. In conjunction with a slightly slanted six- degree room layout, this ensures an unobstructed view throughout the motorhome with no interfering contours. This clean look is underlined by the continuous living area floor, which can be suitably enhanced throughout the vehicle by indirect lighting in the plinth area. The Eriba Touring 820 boasts an extremely extravagant and futuristic look. The exterior of the caravan makes a design statement with its smooth metal, silver cladding and characteristic ERIBA Touring styling. The striking window fronts in the front and rear accentuate the vehicle’s handsome design. The interior also impresses thanks to a unique sense of space – the dark furniture finish contrasts with the bright surfaces and the striking, round shape of the furniture elements, which are reminiscent of modern yacht designs, to create a particularly classy ambience. In addition, your eye is im- mediately drawn to the newly designed kitchen unit with the large porthole – the worktop continues up the wall to the ceiling, forming a visual framework for the luxu- rious kitchen. The 180° Panorama Lounge in the front also provides a unique all- round view. The Red Dot Design Award is presented by the Design Zentrum Nordrhein- Westfalen e.V. The association has been awarding special product designs since 1954 with its “Design Innovation Award”. In 2000 it was renamed the “Red Dot Award.Product Design”. Since then, the Communication Design and Design Con- cept categories have been added in the form of two additional competitions. There are three qualitatively different awards in the competition: “Red Dot: Best of the Best”, “Red Dot” and “Honourable Mention”. Each year, a different jury consisting of internationally renowned design experts assesses the numerous submissions. 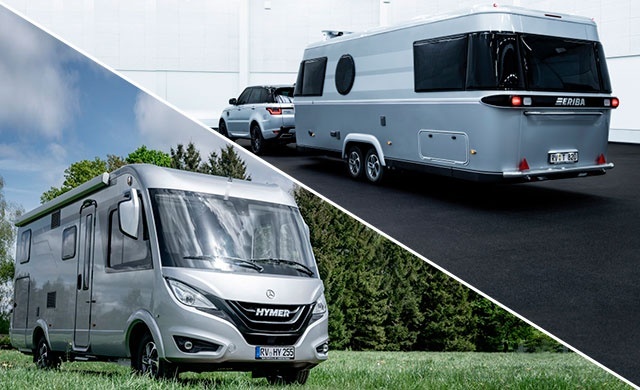 The Erwin Hymer Group brings together motorhome and caravan manufacturers, accessory specialists as well as rental and financing services under one roof. With more than 6,400 employees worldwide and around 59,000 leisure vehicles, the Group achieved a turnover of EUR 2.3 billion in the financial year 2017/18. 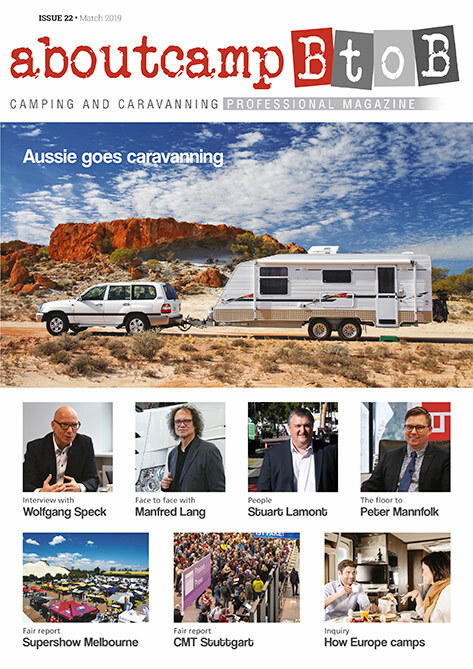 The Erwin Hymer Group includes the motorhome and caravan brands Buccaneer, Bür-stner, Carado, Compass, Dethleffs, Elddis, Eriba, Etrusco, Hymer, Niesmann+Bischoff, Laika, LMC, Sunlight and Xplore, the motorhome rental companies, McRent and rent easy, the chassis specialist Goldschmitt, the accessory specialist Movera, the tent caravan manufacturer 3DOG camping and the travel portal freeontour.